Lawyer Eleanor Washburn defends wayward teenagers and supervises volunteers for Habitat for Humanity without missing a beat. But she is unnerved by fascinating single dad Pete Beck—especially since his chaotic life includes a little girl wishing for a mother. Sweet Cassie has Eleanor yearning for what's been missing from her lonely existence. Soon, both dad and daughter are chipping away at Eleanor's defenses. 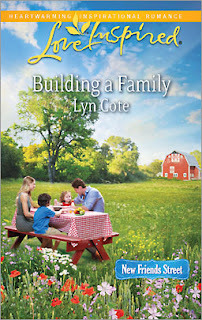 Can she find the courage to risk losing her heart to this ready-made family? I set it in a fictitious town of Hope WI within easy driving distance of my own hometown in the northwoods of Wisconsin. I also mention a regional mascot, the Hodag. Don't know what a hodag is? Follow this link and tell me what you think! Does your locale have any mythic creatures or figures? Under the intense June sun, Pete Beck parked his new blue pickup under a shady maple on New Friends Street in Hope, Wisconsin. "Here we are," he announced to his two teenaged passengers. Ignoring the negative vibes rippling from them, he slid out and folded his seat forward to help his exuberant four-year-old daughter Cassie out of her booster seat. Under a blue, blue sky, he swung little Cassie up into his arms and kissed her cheek with a loud raspberry. She shrieked, "Daddy!" and giggled. The two teens climbed down from the truck and trailed after him, their hands shoved into their pockets. Pete experienced a flash of sympathy for the two teens. Maturing from a boy to a man wasn't ever easy. Before he could stop her, Cassie squirmed and broke out of his arms, running ahead. "Cassie!" he called. "Wait!" He raced after her. He caught up to her just as she halted in front of a tall African-American man holding a little girl about the same age as Cassie. "Hi." Cassie waved up at the little girl. "Pretty. In your hair." Cassie pointed to the bright beads braided into the dark hair. "You need to say thank you," the man said, letting his daughter down to join Cassie. "Thank you," his little girl parroted, pointing at Cassie. "You got sunshine in your hair." "I do?" Cassie looked upward at her own hair. "Some people call her hair strawberry-blond," a soft woman's voice said from behind Pete. He turned and saw Eleanor Washburn approaching him. She looked different than she had that bleak day back in March when they'd met. More relaxed. Even kind of pretty. "I'm Kevan Paxton," the African-American man said, offering Pete his hand. Pete shook it. "You're the family that's getting this Habitat house, right?" Kevan grinned. "Yes, we're the lucky family—"
"I'm Cassie," Pete's daughter said to Kevan's little girl. "What's your name?" "I'm Tiesha. My mama's gonna have a baby." The little girl rested her head on her mother's rounded abdomen. "I gotta big brother. He's at Little League with my grandma." The adults, who'd paused to listen to this exchange, chuckled. "I'm happy you came," Eleanor said, holding her hand out to Pete. "Kevan, this is Pete Beck, the building-trades teacher at the local high school. And I see he's brought along two of his students." Pete took Eleanor's hand, surprised to feel calluses on her palm. That shouldn't surprise me. This is the third Habitat house project she's directed. The two teens, one on either side of him, nodded, then mumbled something. Both refused to make eye contact. Kids. They thought they knew it all, yet they had so much to learn. Eleanor glanced at her watch. "It's time for me to get the dedication started. Kevan, will you bring your family forward so I can introduce you?" She smiled at Pete and patted Cassie's head, then turned and walked toward an area already excavated for the foundation. Pete couldn't help watching her go, assessing her. "She's why we didn't want to come," Luis, one of the teens, said under his breath, near Pete's ear. "We been in trouble, you know? She defended us in juvenile court so she knows what we did. I mean, it was just stupid stuff, but we got in trouble for it." Luis lowered his voice more, as if not wanting Cassie to hear. "That lady's down on us, man." "All in your imagination." Pete reached down to take Cassie's hand. But she was running again. He hurried after her. How could little legs move that fast? Eleanor took her place at the front of the crowd. A bee buzzed past her nose. She began her welcome. "Good morning!" she called out, holding up her hands. The crowd quieted and turned toward her. "I'm so glad you've come to the dedication of the final Habitat house to be built here on New Friends Street." She smiled with all her might, hoping her zeal would prove contagious. "I'd like you to meet our Habitat family." She motioned with her hand. "Kevan, will you please come forward and bring your family with you?" Kevan Paxton. This little sweetheart is our four-year-old daughter." His little girl favored Kevan. "And this is my wife, my strength." With hair neatly beaded into corn rows, his wife looked happy, healthy—and very round. "As you might notice, another little Paxton is due to arrive in August." Laughter punctuated the well-wishes called out. Eleanor noted that the two little girls were holding hands. The sight of such innocent sweetness touched her deeply. "Thank you, Kevan," Eleanor said. "And thank you for your service in Iraq—"
Spontaneous applause and whistling broke out. When the applause ebbed, she started to speak about Habitat for Humanity. Kevan and his family moved away to stand beside Pete. Then someone yanked her pant leg. Eleanor glanced down to see Pete Beck's pretty little girl with her strawberry-blond hair. Cassie lifted her arms to Eleanor. The gesture was unmistakable; Eleanor's response was automatic. She swung the child into her arms—and felt herself swept up in brand-new sensations. She couldn't recall ever holding a child. The desire to have a child of her own coursed through her with startling force. The little girl wrapped her arms around Eleanor's neck and hugged her. Then she leaned back and, nose to nose with Eleanor, said, "You're pretty." More chuckles bubbled up from the crowd. Eleanor couldn't speak. The child's innocent, impulsive gesture had wrapped around her vocal cords. And she loved the child's soft weight and chubbiness and strawberry-shampoo-scented hair. I want a little girl of my own, Lord. Pete hurried forward, his arms outstretched. "I'm sorry. Cassie, you're interrupting Ms Washburn." Cassie clung to her as Eleanor studied Pete's face. He looked chagrined. This loosened Eleanor's throat. "No harm done, Mr. Beck. She's no trouble." She looked at Cassie. "You can stay if you'll be quiet. You see, I need to talk to these people." "I'll be quiet," Cassie vowed, her teeth denting her lower lip. After both Eleanor and Cassie nodded, he returned to where he'd been standing with the two teens. Cassie's presence added a new zest to Eleanor's mood as she put her enthusiasm about the two previous Habitat houses into words. The recipient of the first of these houses, Rosa Chambers, hurried over from Eleanor's yard a bit tardy and waved at her from the back of the crowd. All the while Eleanor talked, Pete's gaze never strayed from her face. Her face warmed not with the sun but from his attention. Could he be afraid that his daughter might say or do something embarrassing? She smiled at him, hoping he'd relax. At the end of her talk, she urged, "Now, I need everyone who's interested in volunteering to give their contact info to our volunteer, Rosa Chambers, the recipient of our first Habitat house built last year." She motioned to Rosa who—as planned—had gone over to a lawn chair in the shade of an oak tree and now sat with an open laptop. The crowd broke up. Some volunteers proceeded directly to Rosa; others stopped to chat. Pete and the two teens gravitated toward Eleanor. They hung back till the few people who'd stopped to exchange words with her moved away. Cassie hugged Eleanor's neck again and then laid her head on her shoulder. The feel of the little girl in her arms broadened Eleanor's smile. And filled an ache within. How precious, this little girl. How lucky Pete Beck was. She turned her attention to Pete, who must be in his mid-thirties, just a little older than she. Pete was good-looking, medium height, brawny build, with dark hair and eyes. The two teens, Luis, dark-haired and wiry, and Colby, blond and tall, flanked him. Her mind zipped back to more than one scene where these two teens had been her pro bono clients, defendants in juvenile court when she'd been their lawyer. Cassie babbled happily and quietly about the people she saw, waving to everybody from Eleanor's arms. A bee flew past Eleanor's ear. Cassie squirmed to get down. "I want to go to Tiesha." After Eleanor released her, Pete intercepted Cassie before she ran away. "Just a minute, Cassie. I need to talk to Ms. Washburn. Then we'll go see the little girl again." Cassie frowned but didn't pout. Tethered by his hand, she twisted and turned, keeping track of the other little girl through the milling crowd of adults. "I'm going to sign up, and I brought Luis and Colby to volunteer, too," Pete said, sounding as if he were measuring each word. "They just graduated and will probably only be working part-time this summer." "Luis, Colby," Eleanor said, "you may go over to Rosa Chambers and give her your information. We'll be happy to use your muscle power for a good cause." Luis and Colby looked to him. He nodded toward the young woman under the oak tree. The two of them loped away, grimacing. Eleanor frowned as they walked off. Working here, helping others would be good for the teens, but these two might not be up to the challenge. "I'll keep them in line." His words were meant to reassure her. Yet he must be aware both teens had been designated "at risk." How could she handle this? While she appreciated his concern for these two young men, her goal was to build this house without delays. Two troubled teens could cause delays by misbehavior or carelessness on-site. "I'll keep them in line," he repeated in a lowered voice. "I'll hold you to that," Eleanor said quietly, but in her "courtroom" tone. Then she made the mistake of looking into Pete's eyes. They were a very deep brown. She caught herself staring into them a fraction of a second too long. She switched her gaze to Cassie, and her heart softened. "I'll go sign up then, Ms. Washburn." Pete turned to go. "If we're going to be working together, you should call me Eleanor, Pete." He nodded and looked down at his daughter. "Okay, Cassie, we'll go see that little girl." Cassie grinned up at him and then grabbed Eleanor's hand. "You come, too." Pete's gaze met hers. "Please join us," he said, his tone somehow negating the invitation. She flashed him a hesitant smile, wondering why and thinking she should really be mingling. But..
As they walked, Cassie grasped her hand, connecting the three of them. Eleanor noted people glancing at the trio they made and—speculating. She loved this small town, but life here could be suffocating at times. Eyes were always watching. She kept her chin up and hoped she wasn't blushing. Cassie broke away from both of them and ran to Tiesha. "Hi again!" "Thanks for volunteering to help out," Kevan said to Luis and Colby, his daughter clinging to his good leg. "It's great to see you young guys reaching out and volunteering. Appreciate it." Luis and Colby grinned and shrugged, obviously out of their depths. "It's our pleasure to be of help. We're grateful for your service to our country," Pete said. Kevan ignored Pete's comment on his military career but smiled down at the two girls. Cassie pulled Eleanor closer to Tiesha. "This is Ella—Ella—"
"Why don't you girls call her Miss Ellie?" Tiesha's mom spoke up. "Okay," Cassie and Tiesha said slightly out of unison. The new title made Eleanor smile, feel wanted in a new and special way. She touched each girl's hair and smiled. "You haven't given me your contact information," Rosa said to Pete with a smile. "I'm pleased to meet you, Rosa," Pete said, quickly giving Rosa what she needed. She handed him the schedule which showed that work started toward the end of the week. "It's time we were off," he said. Both Cassie and Tiesha had squatted to observe a busy anthill nearby. "Come on, Cassie." "But I don't want to leave Tiesha," Cassie objected. "Cassie, you'll see Tiesha again sometime soon—promise. We've got to take Luis and Colby to apply for summer jobs today." He motioned to Cassie to come to him. Cassie looked unhappy but obeyed. She halted beside Eleanor. "Will you come and see me, Miss Ellie? I live on my grandpa's farm—"
The last of her words were obliterated by a motorcycle roaring up New Friends Street. Pete recognized that motor. He turned to watch his brother rock to a halt at the curb. A sideways glance told him that Eleanor, "Miss Ellie," looked uncertain. Did she equate "biker" with "trouble" like a lot of people? Like mindless moths to a flame, the two teens broke into a run, heading for the bike. His brother Mike climbed off the cycle and shed his gloves and helmet. The two teens flocked around him. He greeted them but, arm upraised, headed toward Pete. Pete sent another glance Eleanor's way. He found himself gazing at three little freckles on the bridge of her nose. And the way her long hair moved with a breath of breeze. "Hey! Pete!" Mike called out, unzipping his leather jacket, which sported a Harley Davidson patch. Six-foot-six with shoulders nearly as broad, Mike towered over his brother. He had a voice like a grizzly bear. "You like to make an entrance, don't you?" Pete replied in a wry tone. Mike just shrugged. "Such a sunny day! Couldn't waste it driving my pickup. Where do I sign up?" A shrill scream shattered the peace. Pete swung around, his heart lodged in his throat. He recognized that voice. Cassie! Where was she? Why had she screamed?